Did you know that in addition to the incredibly popular Fountain of Rings at the Centennial Olympic Park, there are water gardens and a reflective pool...and in the winter, there's even an ice skating rink? That's a lot of water, even for a 21-acre park. As much fun as the Fountain of Rings is, and I love the four daily Fountain shows with accompanying music, the water gardens (photo), near the Quilt gardens, are my favorite. They're such a delightful respite from the city, even though you can still see the city all around you. As a matter of fact, in this photo you can see the top of the world headquarters of CNN, home of the Inside CNN Studio Tour. 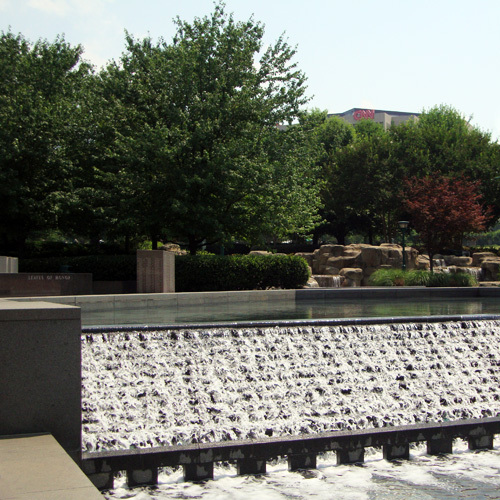 And there are lots of other attractions near Centennial Olympic Park, so go splash, play, and enjoy!